I’ve never known for sure if breakfast is the “most important” meal of the day, but these days it is most certainly my favorite! As I mentioned in my last few posts, I love to repurpose leftover chicken, rice, or whatever else I have in the fridge to make new exciting meals. 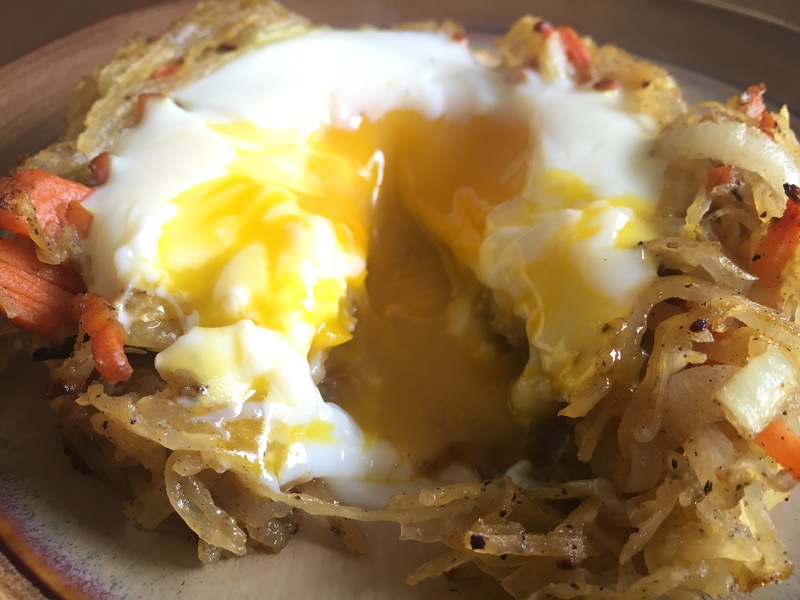 This morning’s adventure involved a desire to use up some leftover roasted spaghetti squash. 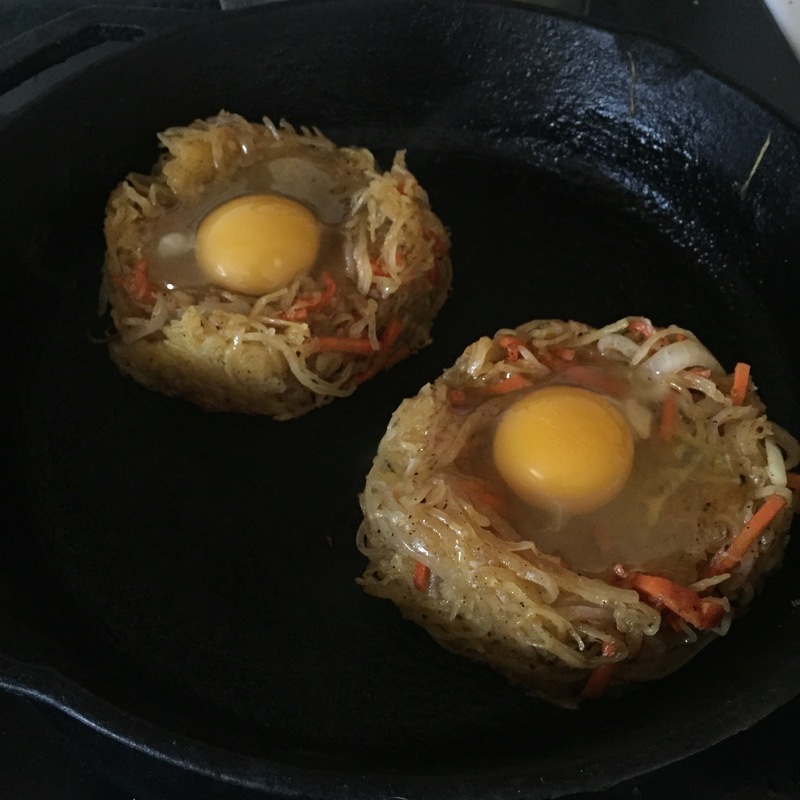 At first I thought I’d just crisp some of it up in a skillet, fry an egg, and call it a day. But then I remembered I had sliced/julienned some extra onion and carrot when I made my soup yesterday, so I tossed that in the skillet. Heat a cast iron over medium high heat, and add your favorite oil (olive oil, coconut oil, earth balance… whatever you want). Add some onion (I used about 1/4 of an onion, finely sliced) and whatever else strikes your fancy (I also had about half a carrot, julienned). I’m sure that finely chopped kale or other greens would be great, as would some bell pepper, mushrooms… whatever you want. But don’t use too much, or else it might keep the spaghetti squash from holding together. Squeeze out previously prepared spaghetti squash over the sink to try to get some of the extra moisture out. I used about 1/4 of a pretty large squash here. I didn’t want a soggy mess in the skillet! This is probably why I got it to hold shape without any binders, so don’t skip it! Add the squash strands to the skillet and season the whole mixture. I used salt, pepper, and some garam masala. I don’t know why… I just thought it sounded good (and it totally was). With a spatula, split the cooked mixture into nests. I split mine in half, flattened it into two big disks, and then built sides up with the spatula. I forgot to take a photo until after I added the eggs, but I’m sure you can get the point from the after photos. Or, you know, if you know what a nest looks like. 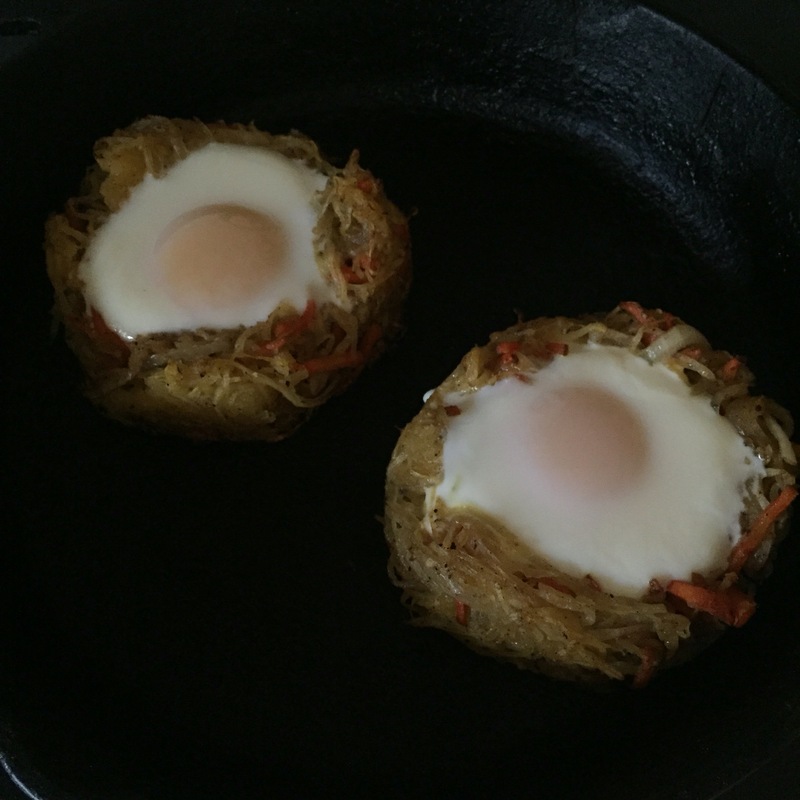 Carefully crack an egg into each nest, and then bake for 8-10 minutes until the whites are done but the yolks are still runny (unless you don’t like runny yolks, in which case I just don’t even know if we can be friends… sorry). Be warned that the cooked whites will still be slightly translucent. If you poke the egg white and are worried it’s underdone, just put a lid on the skillet (outside the oven) for a minute or two. It will help the white set without overcooking the yolk. 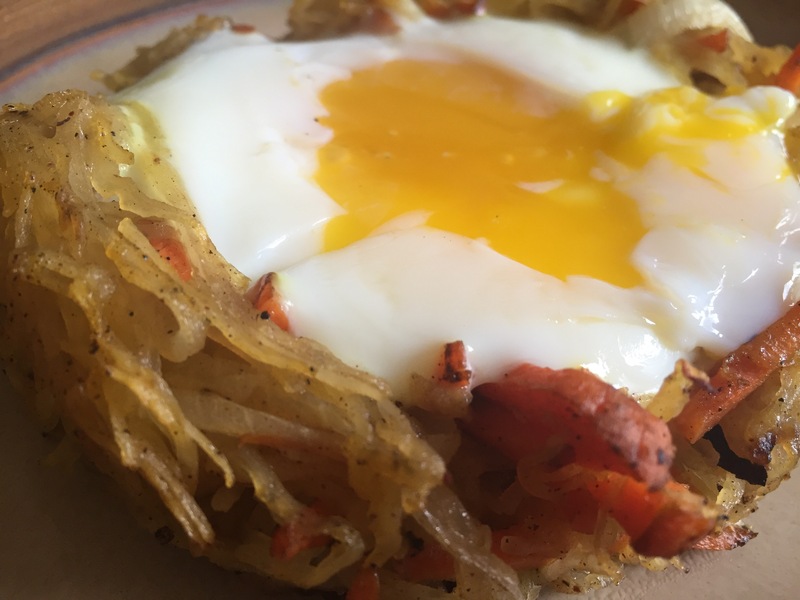 Carefully lift nest out of skillet and onto a plate and prepare for greatness! And add more salt and pepper and whatever other seasoning you wish if needed — mine needed a little more salt. Previous Post Miso for Breakfast? What a great slow stove breakfast. I wish my eggs came out like that, Chloe.